Dr. Sean Hillock earned his Bachelor of Science degree at the University of Florida in Gainsville in 1995. He then graduated with honors and received his Doctorate in Veterinary Medicine at the University of Florida College of Veterinary Medicine. Dr. Hillock completed an intership in small animal medicine and surgery at Long Island Veterinary Specialists and subsequently completed a residency in Internal Medicine under the direction of Dr. John Fondacaro. 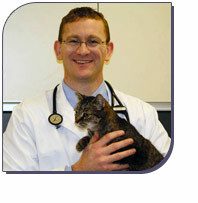 He is board certified by the American College of Veterinary Internal Medicine. His professional interests include canine and feline respiratory, urogenital, hematological and hepatic diseases. The Internal Medicine department is available for consultations Monday through Saturday.